If you were a book, what kind of genre would you be? Would you be a mystery? Or what about a fantasy? Would you even be an action / adventure? In Nickelodeon’s exciting and spectacular, highly-anticipated movie, Escape From Mr. Lemoncello’s Library, get ready to delve into Mr. Lemoncello’s new, high-tech library, that opens the doors to fantastical worlds you could only imagine. When Kyle Keeley, Akimi, Sierra, Andrew, Charles and many others are invited to visit the awe-inspiring library, they are welcomed with flying hardcover books and interesting rooms with pure excitement. However, when things get out of hand and when literary characters start running amok, the kids must solve intense riddles and gather clues to get everything back to normal. Needless to say, Nickelodeon’s Escape From Mr. Lemoncello’s Library, which is based on Chris Grabenstein’s New York Times best-selling book of the same name, will be one magical movie that we all will be obsessed with. The remarkable movie will have you at the edge of your seat with tons of thrilling moments, lots of adventure, and an incredible amount of joy. The outstanding movie stars Nickelodeon veterans Casey Simpson and Breanna Yde. In addition, Russell Roberts, AJ Rivera, and Klarke Pipkin also star in the film. Escape From Mr. Lemoncello’s Library is truly another one of Nickelodeon’s many masterpieces. It captures all of the marvelous moments from the book in such a magnificent way with its own special twist. This brilliant movie stands out as one of the network’s best as it has some of the most unbelievable and jaw-dropping stunts and awesome, super intricate sets. The exceptional cast and crew did such a sensational job bringing this movie to life and it will definitely be everyone’s favorite movie to watch. The wonderful cast of the movie had an excellent time as they celebrated the premiere of their movie at the Paramount Studios in Los Angeles, California on September 25, 2017. Breanna Yde, Casey Simpson, Klarke Pipkin, and AJ Rivera had a fabulous time being reunited at the premiere and watching their hard work on the big screen. Other amazing Nickelodeon stars came out to support the event including Lilimar, Aidan Miner, Kyla Drew, Armani Barrett, Lexi DiBenedetto, and Amar Wooten. In addition, Escape From Mr. Lemoncello’s Library author, the one and only, Chris Grabenstein also proudly attended the premiere to see his book transformed into a big screen masterpiece. I, Alexisjoyvipaccess had the greatest honor of covering the premiere of Nickelodeon’s Escape From Mr. Lemoncello’s Library. This movie is absolutely stupendous and a great film for everyone – families and friends to watch together. It has everything you could ask for in a movie – adventure, imagination, and it is bound to put the biggest smile on your face. 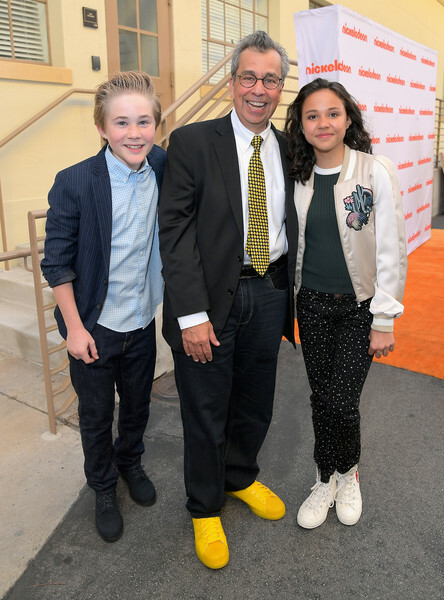 Check out some VIPAccessEXCLUSIVE pictures below from my coverage of the premiere of Escape From Mr. Lemoncello’s Library and be sure to stay tuned for interviews with your favorite Nick stars from the event on Youtube.com/alexisjoyvipaccess! Don’t forget to tune in to the premiere of Escape From Mr. Lemoncello’s Library on October 9th at 7:00 PM ET / PT on Nickelodeon! Previous Article: The Universal Standard Apparel Brand Is Coming To Los Angeles During Its 12 City Tour – Find Out More Deets About The Model Search And Pop-Up Shops! Next Article: Jordyn Jones, Tori Spelling And More Joined YouTube Sensations Sandra And Spidey At The L.O.L Surprise! Big Big Surprise Party – RECAP Here!